Another highlight and a very special experience of our tour through China was a two and a half day cruise on the longest river of Asia, the Yangtze. It is the lifeline of China with a length of 6.380 km and, after the Nile and the Amazon, it is the third longest river in the world. Between Chongqing and Shanghai there is regular passenger traffic, covering a distance of 2500 km. Beyond that the Yangtze and the Yellow River are connected by the Grand Canal of China, also known as the Beijing-Hangzhou Grand Canal, which is the longest ancient canal or artificial river in the world. We boarded our cruise ship “Yangtze Pearl” at Chonqing, a city of 32 million people. The ship offered the comfort of an upper middle class standard which included internet access, and had a surprisingly pleasant ambience which came from a mixture of European generosity and Asian design. The cabins were spacious and the large windows provided a lovely view of the passing scenery. On board we could admire and purchase choice handicraft and watch a Chinese silk embroiderer working on elaborate designs. The chef and his team spoiled us with delicious European and Asian dishes and exceeded all expectations by providing a grand captain’s dinner. Our first stage was the Ghost City Fengdu. We found the formerly 50,000 souls counting city already deserted and by now it is deep beneath the waters of the three Gorges reservoir. 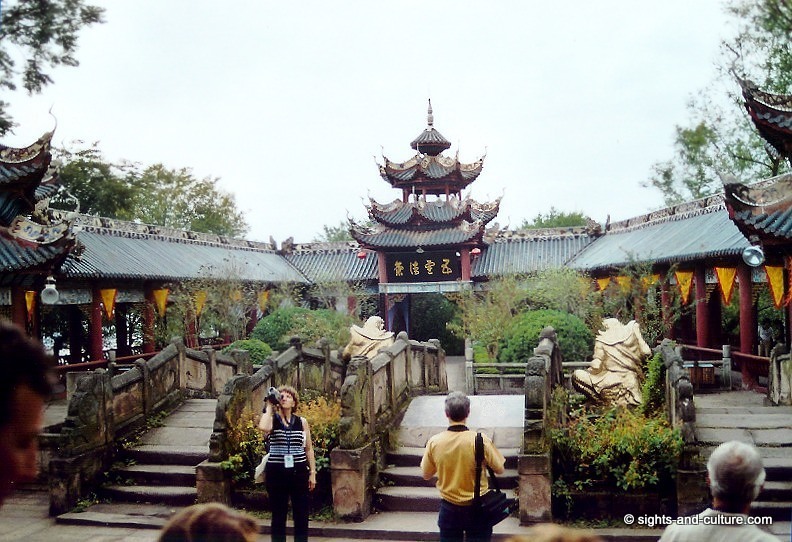 According to Daoist philosophy Fengdu is considered the entrance to the kingdom of Hades which is a 1600 year old temple complex that stretches to the summit of the Minshan Hill. Thanks to its higher location, this famous pilgrimage site has survived. In 2005 we had to climb 620 steps to reach the God of the underworld, a somewhat exhausting experience but worth it. However there is also a lift on the other side. 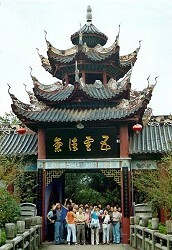 In the Kingdom of hell, on the summit of the Minshan Hill, mythological figures and scenes are displayed and one can find temples and a pagoda that are worth seeing, but before visitors are welcomes by the 6 meter tall figure of the king of hell, they must pass diverse tests which are meaningful for the well-being and woe in their further and next life. 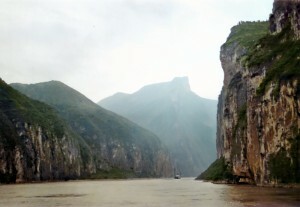 The highlight of each Yangtze cruise is The Three Gorges, renowned for their magnificent scenery. However our attention was again and again drawn to the controversial and much discussed construction of the Three Gorges Dam which would dam up the water of the Yangtze through all three gorges up to the city of Chonqing. By this time the project was already in full swing and the planned water level was marked at the mountain slopes along our route. 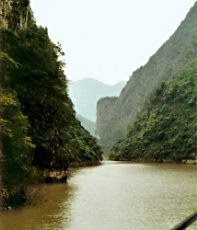 The first of the Three Gorges is the Qutang Gorge. This is a narrow, rocky gorge of max 150 metres width where mountains of 1300 metres high loom up majestically on both sides. With a length of 8 km it is the shortest of the three gorges, but very impressive. It is followed by the 45 km long Wu gorge (Wu Xia ) or Witches gorge, where the Yangtze winds through the Wushan mountains with their famous twelve summits. Bizarre shaped rock formations, which rise sharply up to 1000 metres on both sides of the river offer fascinating views. For the next morning a sail was arranged on the 60 km long Shennong river, which flows into the Yangtze at Badong. This led us through narrow canyons, flanced by towering mountains, which are known as the Lesser Three Gorges, up to a settlement of the Tujia people, a Chinese minority. There we boarded their traditional fast rowing boats, similar to sampans, for an excursion in almost untouched nature. 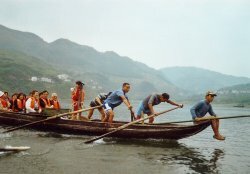 In shallow river water Tujia people hauled our boats with ropes as they have done for generations. During the sail a young Tujia woman entertained us with Tujia folk songs – an unforgettable and romantic experience, but our high spirits were spoilt by the thought that these settlements would soon vanish in the rising waters of the Yangtze, which would change the entire lives of these people. 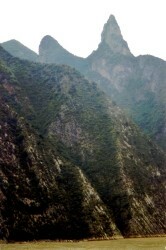 Back on our cruise ship we passed the 66 km long Xiling Gorge which leads directly to the Three Gorges Dam. 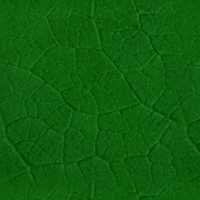 It is wider than the other gorges and also lined by steep massifs but there are also some plantations With its numerous shoals it is known to be a very dangerous section. 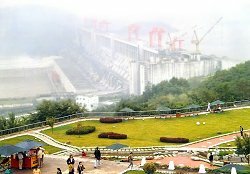 The last stage of our cruise was the Three Gorges Dam. It was still under construction, but already offered a grand view. The original plan of the project was completed in October 2008 when the 26th generator was activated. It is the largest hydroelectric power station in the world but 6 more generators will be installed before 2011. More than 18000 people were involved in the construction. Better flood control and navigability, generation of energy and supply of water for the north are the benefits of this grandiose building, but only time can tell the full extent of this incredible environmental impact.